Well hello, and happy new year. Or happy new decade, actually. Has it sunk in for you yet? It hasn’t for me, that’s for sure. I just can’t figure out where the last one escaped to. I remember my stepdad telling me when I was young that the older I got, the quicker time would seem to pass. Isn’t that the truth! Every time I think about that it kind of scares me, since I’m not that old, yet the years already seem to be flying by faster than I can keep track of them. But ready or not, here we are in the tens, or teens, or whatever they’re going to end up being called, and despite the fact that I don’t know where the past decade went, there is something undeniably exciting about facing the totally clean slate of a new one and contemplating its endless possibilities. And particularly so, since many of those possibilities are meals! By my count, at three meals per day minus a few weekend days when breakfast happens too late to fit in lunch, there are about 10,400 meals to look forward to in the next ten years. That’s a lot of food, but quantity alone doesn’t even begin to tell the story. How many of those ten thousand meals will involve the discovery of a new favorite dish? How many will happen in a favorite new restaurant? How many will involve deciphering the menu in an unfamiliar language on unfamiliar shores? How many will be shared with people who haven’t yet come into our lives? How many will be eaten in bed, scattering crumbs into all the crevices of the sheets, and how many will happen on a blanket in the grass, the hot sun glinting off glasses filled with warm champagne? Hopefully many, and then some. While I may not know the specifics, I do know is that regardless of where, how and with whom these meals take place, I’m planning on enjoying them all to the fullest. Maybe not three-course affairs every time, but meals that are as memorable, meaningful and delicious as I can make them. And on the topic of delicious, I’m also planning to make sure that quite a few of them include chicken liver pâté. 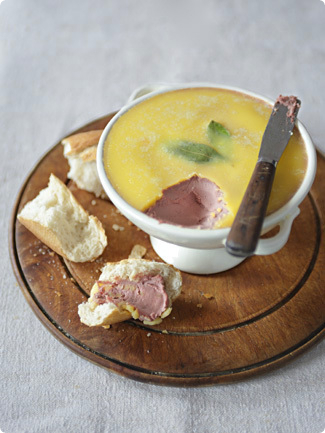 Though not just any chicken liver pâté, mind you, this chicken liver pâté. I made it as an appetizer for the Italian-themed meal we hosted on Christmas and honestly, words can’t describe how much we loved it. Creamy, meaty and complex, it needs no mustard, pickles, or compote-of-this-and-that to come into its own – its subtle sweetness and hint of tang balance the richness from within. I don’t think it would be a stretch to say it’s in the top two or three pâté/terrine/mousse-type things I’ve ever eaten, including those made with truffles, foie gras and other regrettably expensive luxuries. It was so good we ended up rationing the leftovers, all but marking the level on the side of the dish to discourage midnight nibblers from secretly depleting the stash. When we ran out, I made a second batch, and I’m already contemplating a third. Now, I know this doesn’t fall under most people’s idea of ‘January food’, what with the post-holiday scale nudging alarmingly upward, but the way I see it is that it’s important to set the tone for the new decade. In other words, leave the dieting for later. As of today, we have 10,340 or so meals left to work with before this decade comes to a close, and I, for one, am already plotting how many of them might be improved with a generous slab of pâté. I have Portland chef Tommy Habetz to thank for this recipe, though I do have one bone to pick with him about it. He calls it a ‘mousse’, which in my book it most certainly is not – that is, unless you’d also consider liverwurst a mousse. Whatever you call it, though, it’s incredibly delicious, and though it boasts a few more ingredients than your average liver pâté, none of the flavors are superfluous. In fact, I found the recipe so perfect that the only change I made was to substitute Madeira for the sweet vermouth, since that’s what I had on hand. I imagine Port would also be delicious, or you could try your favorite sweet fortified wine. The only other change I might make next time is to skip the marination step for the livers, and just add the brandy, bay leaves and extra garlic to the pan as they cook. Since everything ends up blended anyway, I can’t see this making much of a difference. In a medium bowl, toss the chicken livers with the brandy, bay leaves and crushed garlic; let marinate at room temperature for 2 hours or refrigerate for up to 8 hours. Drain the livers and pat dry; discard the bay leaves and garlic. In a large, deep skillet, heat the oil. Add the onion, pancetta, anchovy and sliced garlic and cook over moderately high heat, stirring, until the onion and garlic are softened, about 8 minutes. Add the tomato paste and stir for 1 minute. Stir in the chicken livers. Add the vinegar and cook until nearly evaporated. Add the madeira, vermouth or port and cook until nearly evaporated and the livers are just pink within, about 3 minutes. Scrape the mixture into a food processor; let cool slightly. Add the cream, thyme and sage to the skillet and cook over moderately high heat, stirring, until the cream is reduced to 1/2 cup (125ml), about 8 minutes. Pour into the food processor and puree. Press the mixture through a fine sieve set over a large bowl, working through as much of it as you can. Season with salt and pepper (don’t be shy with the salt; it should taste very well-seasoned – test a little on bread if you’re not sure). Scrape the sieved mixture into a terrine or other serving dish (at least 2-cup/500ml capacity). Melt the remaining 4 tablespoons butter and pour over the top of the pâté to seal (for decoration, top with a bay leaf before pouring on the butter). Refrigerate until chilled and firm. Serve with crackers or toasted baguette slices. Happy New Year! This pate sounds absolutely fantastic! I’ve had this recipe in my que for the longest time. I’m still waiting for an excuse to make it, maybe I should just make one up. When I saw the photo I thought that was schmaltz on the top. Either way, though, yum. I love making chicken liver pâtés (or mousses or whatever) because they’re so easy but seem fancy.I absolutely love the dish you served this in, by the way! yes, please pass that gorgeous looking pate over my way! I made chicken liver pate on several occasions in December – my favourites being with glögg and the other one with sauteed onions. But anchovy and pancetta? Never tried adding these before. Also, most recipes here use lots of butter – need to try your version with cream! !Have a lovely 2010, Melissa! Yum! I have to make this! I’ve always wanted to make my own pate. Hi Melissa, it’s my first time commenting. I don’t know if perhaps you posted another recipe, I would still be a lurker, but the RUSTIC chicken pate? This warrants my rant here. I’m with Pille – the combination of chicken livers, anchovies, and pancetta is plenty intriguing. Thanks for sharing. Oh my goodness. That looks incredible! Love your site, by the way. Every post is so well thought-out. happy new year to you too! i loved tommy’s little sandwich shop, bunk. i imagine his pate (and your version) must be just as good, going on my to-make list! This pate doesn´t only sound fantastic, it is fantastic! Well I assume it is because it is French.Nevertheless thanks for the post. It was a pleasure for me and for my guests! Happy new decade to you too, albeit a little late. Lovely pate! Something I will eventually attempt. Love the sounds of this recipe! I think chicken livers get forgotten too often. In fact, I’m remiss in making this kind of pate myself. I used to make one with green apples – good combo- that I’ve completely forgotten about. Thanks for the wake up call. I just wanted to let you know that I only recently discovered your blog. One word, fantastic. I am originally from Ireland and we would eat pate all the time. I just never realised what went into it and to be completely honest, the thought never crossed my mind to make it. Well, make it I did. This weekend. It was delicious. It was better ten times better than the store bought varieties. So thank you for a wonderful receipe. The homemade Vanilla Extract is next on my list. My first batch has just finished cooling. It is absolutely amazing, thank you for posting it. I have a new favorite pate recipe. I had some mead on hand and it works beautifully in place of the wine, it gives a very mild sweetness. I definitely have to play around with it, never could leave a good recipe alone. I love pate — this one looks absolutely divine! Wow, that is one seriously good-looking pate, and what a number of lip-smacking ingredients to its name! I’ve only ever made one pate (also with sage and port), only because that one has always been a stand-up-&-shout favorite; but this, well, this will be made after I do the weekly shop at the at the farmer’s market. I’ll call Jean-Louis the butcher and ask him to set aside the 450 g of liver. And I just picked up a darling little stoneware piece at the marche aux puces that’ll hold it beautifully. Good things to look forward to… Thank you for sharing! That sounds like a fantastic pate recipe!